This is part 4 of NCLEX-PN Practice exam. Click on this link to get NCLEX-PN Practice Exam Part 1 and NCLEX-PN Practice Exam Part 2 and NCLEX-PN Practice Exam Part 3. This exam series will have 8 parts and each will have a total of 25 questions with answers and rationales. 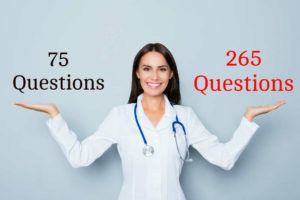 If you want to practice more questions like this, we strongly suggest to get a copy of NCLEX-PN Practice Questions and NCLEX-PN Exam Cram from informit.com. 1. The nurse is caring for an 8-year-old following a routine tonsillectomy. Which finding should be reported immediately? 3. Which of the following meal selections is appropriate for the client with celiac disease? 4. A client with hyperthyroidism is taking lithium carbonate to inhibit thyroid hormone release. Which complaint by the client should alert the nurse to a problem with the client’s medication? a. The client complains of blurred vision. b. The client complains of increased thirst and increased urination. c. The client complains of increased weight gain over the past year. d. The client complains of ringing in the ears. 6. The nurse is caring for a client hospitalized with bipolar disorder, manic phase. Which of the following snacks would be best for the client with mania? 7. A 2-year-old is hospitalized with suspected intussusception. Which finding is associated with intussusception? 17. What information should the nurse give a new mother regarding the introduction of solid foods for her infant? a. Solid foods should not be given until the extrusion reflex disappears, at 8–10 months of age. b. Solid foods should be introduced one at a time, with 4- to 7-day intervals. c. Solid foods can be mixed in a bottle or infant feeder to make feeding easier. d. Solid foods should begin with fruits and vegetables. 22. The nurse is caring for a client with a history of diverticulitis. The client complains of abdominal pain, fever, and diarrhea. Which food was responsible for the client’s symptoms?